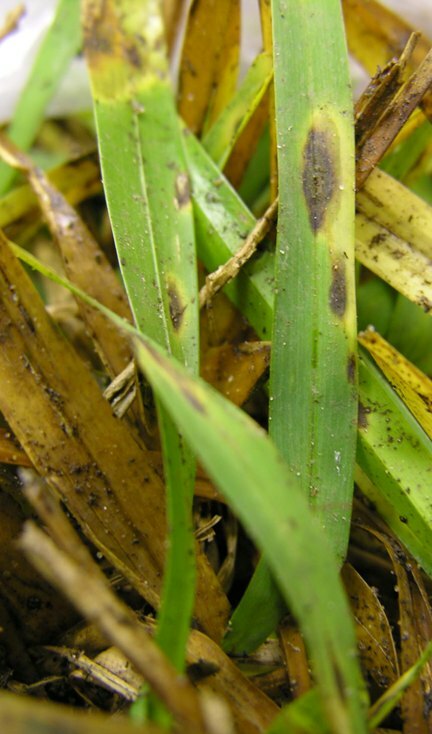 Gray leaf spot is most commonly detected on St. Augustinegrass, but is occasionally seen on fescue in South Carolina. Initial lesions are small and brown, but they expand rapidly to large, oblong, tan-to-gray leaf spots with purplish or brown borders. A yellow halo may surround the spots, or general leaf chlorosis (yellowing) may occur. During humid weather, the fungus produces a grayish mycelium (the vegetative part of a fungus) and numerous spores on necrotic tissue, causing a gray appearance to the spots. Under favorable conditions for this disease, large areas of turf may appear to be scorched. The fungus survives adverse conditions as fungal tissue (mycelium) or conidia (spores) in leaf litter. When favorable conditions return, sporulation occurs and conidia are dispersed by wind, splashing water, equipment or animals. When warm temperatures, moist conditions and high humidity persist for several days, conidia germinate and infect susceptible tissue. Frequent irrigation makes conditions more favorable for disease. Optimal temperatures for fungal growth range between 77-86 Fahrenheit. The disease is often more severe on new sod than on established turf, especially when nitrogen fertility is moderate to high, so avoid excessive nitrogen fertilization. Other stress factors, such as a chinch bug infestation, soil compaction, drought and herbicide stress can predispose the turf to gray leaf spot, so use management practices that avoid these stresses. There are several St. Augustinegrass varieties that have resistance to this disease, but unfortunately, these are more susceptible to chinch bugs.